One of the most common reasons for delays in the marketing approval process is stakeholders not providing clear feedback or providing the wrong type of feedback. 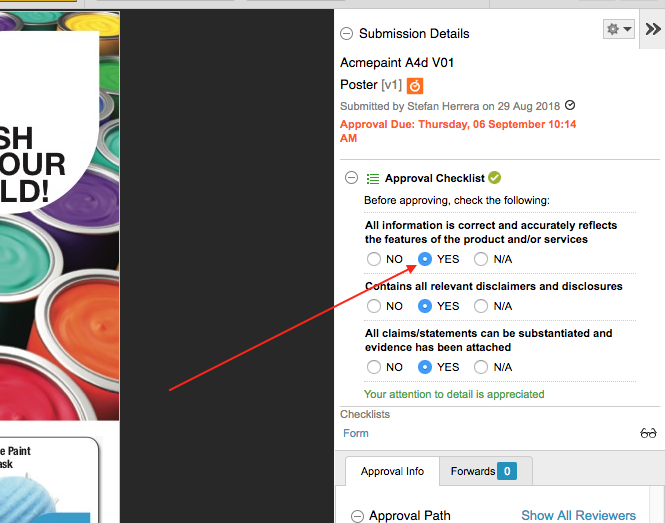 Admation’s new Approval Checklist feature enables you to set up a list that stakeholders need to check off before submitting their feedback to ensure that it is accurate. Reduces artwork revisions as stakeholders have a list of feedback requirements to adhere to. Resources aren’t caught up in a never-ending cycle of artwork changes caused by inaccurate feedback. Decreases the chance of errors being missed and going live to the public. Reduces bottlenecks improving your overall turnaround on creative projects. Improved efficiencies which means better returns on your marketing projects. When a checklist is added to an approval, all stakeholders will be required to complete the checklist prior to providing feedback. As a reviewer, the Approval Checklist feature is situated on the side panel next to the item you are reviewing. Once you have completed your feedback, and before you approve or reject the item, you need to fill in the checklist by providing an answer to each question. 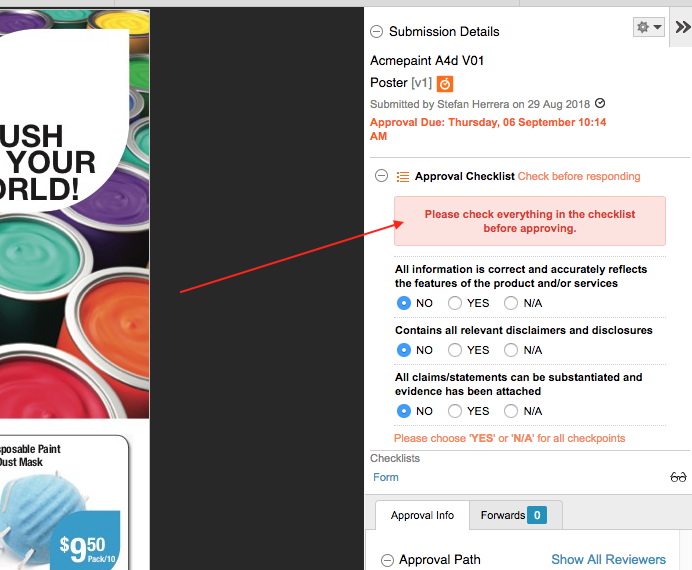 Please note that you will see a warning message if you attempt to either approve or reject the item without completing the checklist first. Likewise, the message will appear if you attempt to approve an item without selecting the correct checkpoints. If you are requesting changes, you’ll still be able to proceed with your change request as long as you have completed the checklist. Once you have completed the checklist, submit your feedback by clicking Approve or Reject. The person who submitted the approval will be able to see whether a reviewer has completed the checklist, as well as read the reviewer’s responses, on the Approval Details page. A successfully completed checklist is represented by a green checklist icon. An incomplete checklist is represented by a greyed-out checklist icon. 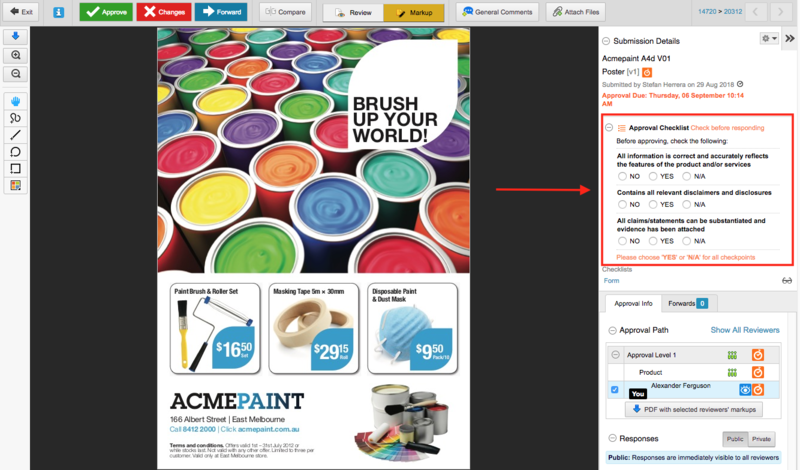 To read the feedback provided by a reviewer, click the correlating checklist icon inline. A tooltip featuring the answers will then display.